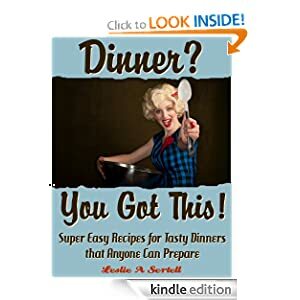 Home book freebies , feature , free books , free reading app , kindle , kindle deals , saving money FREE BOOK: Dinner? You Got This! FREE BOOK: Dinner? You Got This! -- With a tiny bit of planning, you can enjoy a mouth-watering meal of Perfect Meatballs or Sweet and Sour Chicken at home. Cheesy Busy Day Enchilada casserole or juicy Baked Pork Chops with Rice can be ready to eat in under an hour with very little fuss in the kitchen. This collection of delicious dinner meals will become some of your favorite recipes that you'll go to again and again. You'll save time and money with these easy to prepare recipes and avoid expensive take-out and fast food. If you love tasty food, but think you don't have the skills to make great meals, these recipes are created for you! NOTE - UK and Canadian books are not always the same price as the US book bargains - and a Kindle book option may not always be available.